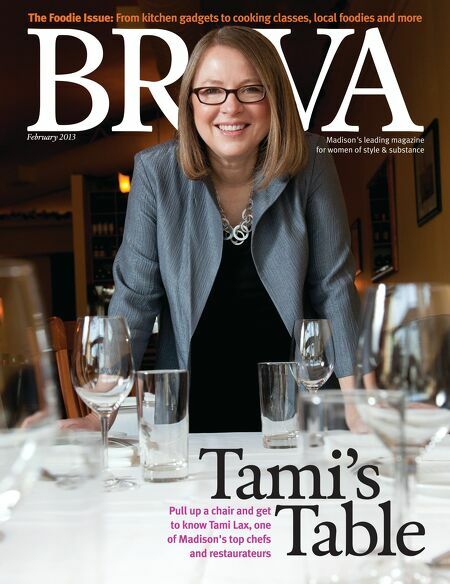 FEATURE: Tamis Table- From small-town Wisconsin roots to becoming a big-time Madison restaurateur, Tami Lax knows when it comes to food, there, no taste like home. FEATURE: Total Transformation- Dozens of women signed up for BRAVAs makeover challenge. While it was tough to narrow down, we zeroed in on five unique women, and with the help of area experts gave them not only a new look, but a new lease on life! FEATURE: Conquer Cabin Fever- Dark days and woeful weather leaving you feeling cooped up? Take a tip (or 12) from area experts to starve off winter blahs by altering your surroundings, moving your body and laughing till it hurts. Around Town: Romantic retreats, family adventures and soul-warming soups. In the Spotlight: Your dont miss events of the month!